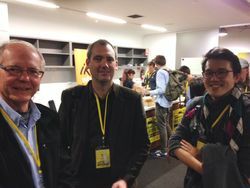 TAD joins the first Australian Enabled By Design-athon! 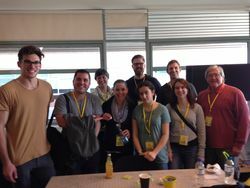 The first Australian Enabled By Design-athon event was held over the weekend with TAD’s Physiotherapist, Rehabilitation Engineer and one of our TAD Volunteers joining the two day ‘ideas and prototyping-fest’ to transform the lives of people with a disability. The event was held in partnership with Enabled By Design, the Cerebral Palsy Alliance and UTS to bring together designers, engineers, marketers and entrepreneurs with teams of UTS students, people with a disability and service professionals to promote universal design – ‘design for all’ – including people with a disability. TAD’s therapy team and volunteers design custom equipment for people with disabilities every day so were excited to join others with the same goal. After some speakers discussing design, the history and the goals of the event, participants were split into 12 teams, each with different skills. The teams broke out and participated in empathy exercises relating to the person with a disability on their team such as writing without the use of the hands, opening a twist top bottle with the use of one hand only and wearing glasses to mimic a vision impairment and getting themselves to another floor. They were then charged with the task to come up with a problem they faced in the empathy exercises, work on a solution and market their final design to the panel of judges who made the final decision. Our Physiotherapist, Brendan Worne, was on Team 3 who designed and prototyped a new lid to replace twist tops on bottles and jars for a person with hemiplegia that only had use of one hand. The team included Meret Hassanen who was a past client of TAD’s. Meret has cerebral palsy and we modified a scooter to make it a 3-wheeler. The team decided on a lid that you could put on a bottle or jar, then pop open by pushing down on it using one hand. They produced a 3D design in CAD, then printed a prototype on a 3D printer. They even built a website outlining the new product! Brendan’s team won the social media award for the event. Nick Asha, our Rehabilitation Engineer, worked to develop a solution for a vision impaired person to better navigate around the community. The team designed a concept for an app to work with Google Maps to give voice directions that included obstacles, different terrain and where users can upload their own safe routes for other vision impaired people nearby. TAD volunteer Tom Yelland’s team also tackled a challenge for people with a vision impairment – finding a guide dog’s poo. The team designed a heat sensing device worn on the wrist, that would make a sound when the person’s hand was within 30cm of the ‘business’. Much like a metal detector, this would beep more rapidly, the closer you got. They named it the Thermo-Echo, named after the guide dog, Echo, on their team. Tom’s team won the well-deserved People’s Choice Award. “We absolutely loved this event, to was so valuable to be linked with the different skilled people in the room. TAD has been designing custom equipment to help people with disabilities to lead more independent lives for almost 40 years and this sort of event, with a strong focus on design, was so valuable,” said Brendan. For more information go to the Enabled By Design website.